NEOTOKYO is a first person shooter that aims to provide a visceral combat experience in a rich near future setting. 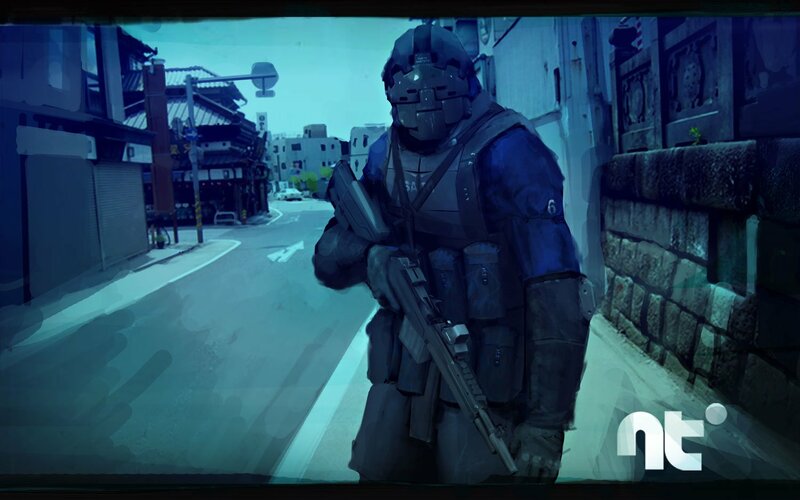 The setting emulates combat between two cybernetically enhanced special operations groups, introducing augmentations such as thermoptic "active" camouflage and networked IFF (Identify Friend or Foe) systems to the urban close quarters combat genre. Players take the role of two opposing forces, the JINRAI and the IM-NSF (Interior Ministry National Security Force). CLICK HERE to go to the NEOTOKYO steam store page. Install the game. Once it's installed press the "play" button. *NEW -----> Drake of clan [TAR] uploaded a really great NOOB VIDEO tutorial. Big thanks to [TAR] for putting this together. You can also check out our noob hints or read the full tutorial below. First, learn what the keys are and set your playername in the options menu. There are plenty of keys to know, so memorize them. Some important ones are "aim" (to bring up a tighter focus and a reticle), "thermoptic camo" (to use your cloaking), "use" and "toss weapon" (to be able to pick up the ghost objective), "special" (to be able to utilize alt-fire for certain weapons), and "lean" (if you want to be able to lean around corners). When you join a game, you are prompted to select your faction, from NSF and JINRAI. The factions are identical in terms of weaponry and strength, so try to choose the one that balances the teams, or failing that, whichever one you think is cooler. Lastly, you select a primary weapon. Over the course of several rounds, you will unlock more weapons (up to 12), but to start you have 3-6 (depending on your class) to select from. The methods for ranking up and unlocking weapons are outlined in the next section. After a short startup, you will arrive in the map. You can now select a squad with the 5-9 keys (which correspond to the five squads - Alpha, Bravo, Charlie, Delta and Echo). Being in a squad shows all your squadmates' locations as cross logos on your HUD at any distance, and even through walls, as well as showing their current condition in the upper left. Don't get shot. Take your time, use your abilities and be careful because there is no healing and no respawning. There are three classes, each with a different set of weaknesses and different playstyle. Below are the main details, and each aspect is explained in more depth afterwards. Movement: Moves quickly and has unlimited sprint, can do a powered long jump. Beginning Weapon Loadout: 3 weapons. Total Weapon Loadout: 9 weapons. Movement: Moves at a moderate speed, has limited sprint. Beginning Weapon Loadout: 6 weapons. Total Weapon Loadout: 12 weapons. Movement: Moves slowly, has no sprint. Beginning Weapon Loadout: 5 weapons. All three classes have a vision mode suited to their playstyle. The Recon class has Nightvision, allowing them visual clarity in low light conditions. This vision mode appears as a grey filter across your vision. Using nightvision in bright conditions will wash out your image with brightness, and you will be unable to see. The Assault class has Motionvision, which highlights anything that moves, for as long as it is moving. This vision mode appears as a faint reddish/yellow tinge across your vision, with glowing yellowish bursts to denote moving targets. The Support class has Thermalvision, which highlights anything that gives off a heat signature. This vision mode appears as a purplish filter across your vision. Colder temperatures appear from purple to black, and warmer from blue to white. It has unlimited range but cover will disrupt your ability to detect someone on the other side. Camo is not complete invisibility. When you activate camo, it makes a flash and a high-pitched noise, so be careful where you activate it. In an open space with bright lighting, or up against a surface with a solid colour, you will be partially visible. Walking or sprinting will make you increasingly visible. Firing an unsurpressed weapon will cause a bright flash and further disruption. Injuries and blood can not be masked by the camo, and so they will appear even if you are not completely visible. Since it is thermoptic camo, it also masks your body temperature. Unfortunately on some maps, this will cause you to stand out anyway as you will appear black or very dark on thermalvision. The best way to be invisible is to stay still and crouched, and place yourself in front of a textured wall or 3D object that will make your silhouette less obvious. As well, if your XP hits the minimum of -1, you can end up with the 'Rankless Dog' rank, at which you can only use the Machine Pistol. A small machine pistol with a high rate of fire, but a high recoil, making it somewhat difficult to control. A basic rapid fire SMG (low damage but high rate of fire). The 50 rounds gives you quite a bit of punch under sustained fire. A suppressed SRM-7, with slightly less damage than it's unsuppressed counterpart, giving up power in exchange for stealth. It is considered the workhorse for the Recon class, providing them with a low detection rate during operations. This is a bullpup SMG, giving it a barrel length equivalent of a compact assault rifle. This accounts for the Jitte having better range than the other SMGs. It also has decent power. A silenced version of the Jitte, it's a good "suppressed" mid-range weapon. It also has a slightly tighter focal length to it's aim in comparision with it's unsuppressed counterpart. Tactical shotgun, good for up close combat, not effective at range. For ranged combat you can load in a SLUG round which is very effective both close and far. You are limited to 5 SLUGS. To load a SLUG round, make sure there is an empty slot (fire the weapon to clear a slot if you have to) and then press the key you have bound to 'special', you will now see the work SLUG in the lower right ammo HUD display. This is a standard assault rifle, well rounded for distance, accuracy, and stopping power. This weapon is a good choice for almost all situations. This is the accurized version of the ZR68 weapon system. It is scoped fire, very accurate, good ROF, and good stopping power at distance. Semi-Automatic MBR (Main Battle Rifle). It has good range, and great stopping power. A scoped version of the Mosok41, it's overall length is increased giving it really good accuracy and range. It has very effective stopping power at any distance. This is a powerful assault rifle that puts a very large round down range. The stopping power is extremely effective. This is the suppressed version of the MX-5. It requires quite a big cannister to provide suppression of the large caliber MX round. The tradeoff for suppression is less power. This is a light machine gun with good power, and capable of sustained fire utilizing it's 100 round drum mag. Good for suppressing the enemy and putting more rounds on them then they can put on you. An automatic combat shotgun. This weapon has tremendous stopping power at close to mid range. Combined with its rapid rate of fire, the AA-13 is extremely lethal during combat operations. An anti-material rifle used by special operations groups. Considered legal for anti-personnel use against operational CEC forces ( Cybernetic Enhanced Combat forces). Sidearm for Recon class. Lightweight compact semi-automatic pistol. Sidearm for Assault class. Automatic pistol, which has an alt fire "mag-dump". To enable the mag dump, press the key you have bound to 'special', which switches it from 'S' (single shot) to 'A' (automatic). Sidearm for the Support class. A 6 round revolver with incredible stopping power and accuracy. A detpack is a large explosive charge with a massive blast radius, which can do high damage. The splash does not go through surrounding walls..
Recon only gains the detpack at Corporal rank or above..
To place it, face the spot you want to put it, and press your fire button to arm it. It will take a couple of seconds to prime, and then you'll see it flop to the ground. Your detonator will now pop into your hand. Just press fire when you want to detonate the charge. A frag grenade is a small explosive charge that is thrown in an arc, and detonates shortly after hitting the ground..
Grenades in NT are quite powerful, with increased explosive power to compensate for taking out combat class cyborg chassis. A direct hit will kill most opponents. It is particularly effective for Assaults to use on the slow moving support class, who will not be fast enough to get out of the blast radius if it lands near them. A smoke grenade is a small canister that is thrown in a similar arc to the frag grenade. Upon landing it pours smoke outward in a burst.. It does no damage. The smoke hangs in the area for about 20 seconds, obscures vision and slightly obscures thermal recognition. This is particularly effective for supports who want to enter an area under smoke concealment while using their vision mode (which can "see through" smoke). Recons and Assaults are at a distinct disadvantage when smoke is deployed in this fashion. Leaning is a good way to not make yourself too obvious of a target. It allows you to look around a corner without moving into the open. It still makes your head visible, but coupled with camo it can keep you out of harm's way. The default keys are Q and E.
If you reload with a primary weapon and your clip is not empty, and remaining rounds in the clip will be discarded along with the spent clip, and replaced with a fresh one. Be careful not to waste too many rounds in this way. Beware of friendly fire. If you point a gun at an ally, your crosshair will become a red X in an attempt to warn you. Not only will teamkilling decrease your rank, if you do enough damage to allies your failsafe in your cybernetic system will kick in and you will be deactivated. So far there are two weapons with alternate fire, activated by pressing the 'special' key. The Tachi sidearm pistol has a mag dump fire, which unloads a clip in a very short time. The Supa7 shotgun can load a powerful slug round, if you have an empty space in your clip. If you are wielding your secondary firearm, your grenade or knife, you will run slightly faster than with your primary out. Sprinting does get you around faster, but always keep in mind that speed is not paramount. Running can disrupt your camo, make yourself more obvious on motionvision, and generally make you a more obvious target. This game, due to the complexity of its textures and props and due to a lack of support for custom shaders, does not support DirectX 8 (or DX8 standard video cards.) None of the vision modes work, camo'd people are completely invisible, and you don't see explosions. Do not run this game under DirectX 8. - TDM:Team Death Match : A last team standing version of deathmatch, no respawning. - CTG:Capture the Ghost : A kind of "one flag" CTF, with both teams fighting for one objective. In this mode, you attempt to collect the Ghost (which appears to be the top half of an android doll) and return it to your team's extraction point. Often this extraction point will be the enemy spawn. The extraction point appears as a glowing arrow on your HUD (your extraction point being blue for NSF and green for JINRAI, and your enemy's extraction point being a red arrow). The ghost, when you get close enough, appears as a radiating circle on your HUD - it will be white if the ghost is on the ground, blue if an ally is holding it (green for JINRAI) and red if an enemy has it. When someone picks up the ghost, you will hear a buzzing tone. In order to pick up the ghost, press your use key (Default: Z). Doing so will drop your primary weapon. You will then have the ghost in your hands. Alternatively you can toss away your primary weapon before reaching the Ghost and then she will automatically attach to your back as you run over her. Holding it for a certain amount of time will activate the neuro-net uplink, allowing you to see all opponents' locations if they are within 45 meters of your position (they appear as glowing red person shapes on your HUD). Using your mic you can then inform your teammates of the incoming threats (teamwork). Use the compass at the bottom to give them directions. If you switch to your secondary weapon, the uplink is severed, but you will be able to fire and defend yourself.